Sometimes, coming up with three or five of anything, like favorite songs, favorite books, favorite meals or top five vacations makes training participants focus their attention on winnowing down their long lists. If you’re a classic movie buff, for example, how can you name five favorites? 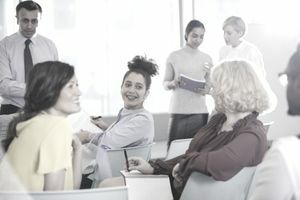 This ten favorites ice-breaker gives you an option when you want your training session participants to concentrate on warming up the conversation with fellow participants instead of spending the time winnowing down to create a shorter list. This ten favorites training ice-breaker makes conversation easy as your group prepares to tackle the more challenging exercises in your training class. Team building and cooperation are a natural extension of the discussion and sharing when you use this the ten favorites training ice-breaker. You will also generally expect to hear a lot of laughter from your training class participants. Humans are funny creatures when you allow them to express their opinions, especially on softer topics that are non-threatening. Tell the newly formed groups that their assignment is to share their ten favorite foods, or their ten favorite actors or actresses, or their ten favorite animals, flowers, trees, and so forth. The topic can be ten of anything—most liked. The key with the ten favorites training ice-breaker is that the participants must easily think of ten choices; in fact, fewer than ten might cause too much analysis and too many choices for a quick, get-to-know-each-other ice-breaker. Tell the groups that one person must take notes and be ready to share the highlights of their group discussion with the whole group upon completion of the assignment. It is a good idea for this person to volunteer. In the absence of a volunteer, the group can devise a fun way to appoint an employee to share. Debrief the training ice-breaker by asking the volunteer note taker to share any insights or points of interest that arose in their discussion. Did the group have commonalities in their answers? Where might group members use this or a similar ice-breaker in their own lives? Since this is a warm-up ice-breaker, depending on the group, and because of the time it adds, you will not generally ask each person to share their whole list with the larger group. But, do open the topic for general discussion as the note takers report because people are always your best source of laughter and fun. When the volunteer from each group is finished, ask the rest of the participants if they have anything they'd like to add to the discussion or ask before moving on to the rest of the session. Time permitting, you may also ask the participants if they can make use of this ice-breaker in their own lives. It usually generates the naming of social groups, children's groups, book clubs, church settings and a variety of ideas that make the time spent on this ice-breaker more meaningful for the group. While usually recommended ice-breakers are related to the topic of the meeting, "ten favorites" is a quick, fun training ice-breaker that people enjoy. No one is asked to leave their conversational comfort zone, and participants are never unwilling to share the answers to this type of question. You can also use this ice-breaker for topical discussion or as an exercise during a team building session. As an example, in a session on training, you might ask, "What are ten dysfunctional behaviors you have experienced when participating in an unsuccessful team?" Or, "Think about the best team you have ever been on. What are ten key factors that made it your best or most successful team?"